Have you ever wished that you could take your daily walk, jog or run through the breathtaking trails of an exotic location like, let’s say, Australia? Or perhaps you’ve fantasized about having all of your favorite social media apps built right into your gym’s cardio equipment to help get through those extra long, extra tough workouts. Thanks to Matrix Fitness, a global commercial fitness brand, such dreams are becoming realities with the launch of their new 7xi console series. 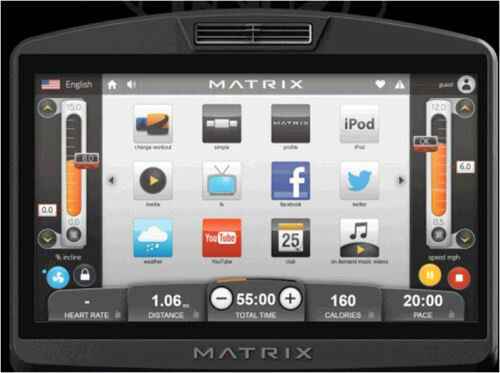 The industry’s first app-based interface is now available across Matrix’s entire line of cardiovascular equipment in worldwide health clubs and fitness facilities. Any exerciser will tell you that the right shoe makes your endurance and workout performance better. And if you’re a combination exerciser and fashionista, throw a little style and color in for happiness. Mix those components together and you’ve got the Therafit Sneaker. I’ve been wearing mine for months now and they don’t disappoint. Therafit’s patented technology was developed to create an incredibly comfortable exercise shoe with support that can be customized. The sneaker starts with many multiple layers of cushioning, all varying in density, which helps reduce aches and muscle soreness. Additionally, each pair is created with a set of three personal comfort adaptors which you can remove or keep in place. These bars slide in and out horizontally into the absorbing wedge. Play around with wearing one, two or three bars and find your perfect comfort zone. The styles are all girls’ names and the color combinations are fun. I’m a fan of the Deborah sneaker in the black and hot pink combo. Also available are all pink, silver, orange, blue and of course, solid black. Another reason to love Therafit is their One Step Forward program which is their commitment to charity. For every pair purchased, one dollar ($1.00) is donated to a charity of your choice. For me, my dollar goes to the Breast Cancer Research Foundation. There are others you can choose from. I love a company that does well and does good. For more information and/or to purchase go to http://www.therafitshoe.com.